Includes a quilted reversible striped polyester pad and a comfy reversible head pillow with polyethylene stuffing tied securely to the frame. With beautiful arnished 52-inch hardwood bar strategically spreading the hammock for easy and safe access. Plenty of room for one person to spread out and relax,Weight Limit is 275 lbs. You're Not Just Buying A Hammock, You're Buying A Lifestyle! Lazy Daze Hammocks believe everybody needs a hammock with stand combo to enjoy your lazy days and our Hammock and Stand Set will be the best choice. Near the pool, on the patio or in the yard, pick a favorite tree, all you need is this portable outdoor hammock and stand combo. And you don't even need tools to set it up due to its spring pin. 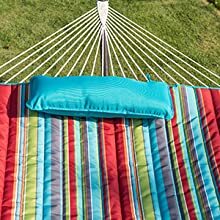 The hammock and stand set has a weight capacity of 275lbs, with the soft cotton pad and polyethylene stuffing pillow, a 12 ft heavy duty hammock stand and all accessories, it can be easily set up in seconds. It’s time to enjoy your patio, backyard, pool, even bedroom all day long with this combo. Don’t subdue yourself to lose a chance in enjoying lazy days! 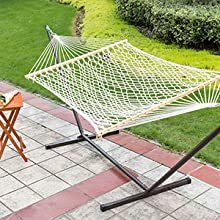 Getting Yourself A Great Hammock with Stand Combo! 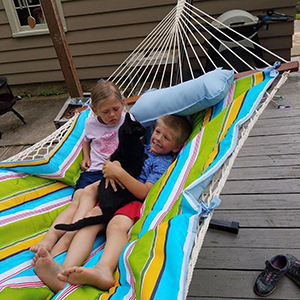 The hammock with stand set may be the outstanding symbol of summertime relaxation, but this set needs not be a staple of the summer months alone: when set up in the right spot, a hammock combo can be enjoyed all year long, whether suspended near a fire pit, accompanied by blankets or, of course, if the hammock set is put indoors. Choosing the right hammock combo, therefore, means considering not only where you will use it, but when. Start by considering the weather the hammock set will have to face. 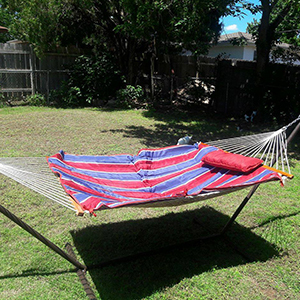 Many hammocks are made with materials designed to resist fading and fraying that can result from long-term exposure to sunshine, but these same hammocks might not resist damage caused by rain and snow. Also, consider the durability of the non-fabric hardware that accompanies your hammock. The comfortable polyester pad and polyethylene stuffing pillow provide incredible cozy bed. Strengthened welding, powder coated surface,and plastic end caps provide Stability and Maintenance-free. 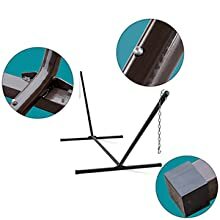 The hammock stand has spring-pins on legs, making assembly easy and portable. Awesome! Love that the cushion ties on and off. We live in a windy region and if we couldn't remove the padding, the hammock would blow over. The whole family loves this edition to our patio. Sister loves it. This is incredibly well-made. The pad is nice and the hammock can be put together easily.? Very comfortable, but a couple of the rope stands were twisted, my husband had to untie and retie the strands. I got this for my wife as a Mother's Day gift from the kids. It is easy to assemble (no trees required...lol! ), comfortable, made of quality materials, and adequately packaged to prevent damage. She loves lying in it and reading or tanning. I would recommend this product. Good value. 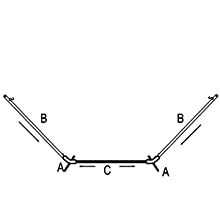 Initially - at least till stretched out a bit - needs additional side tie connection for better stabilization.